Before the Discovery space shuttle, before modern military and commercial jets, before hydro-planes, before early open (and often gut-wrenching!) planes, there was nothing but the birds and a occasional balloon. The day before the Wrights flew, a newspaper stated that nobody would ever fly. The next day at Kitty Hawk, the Wrights glided over its dunes. 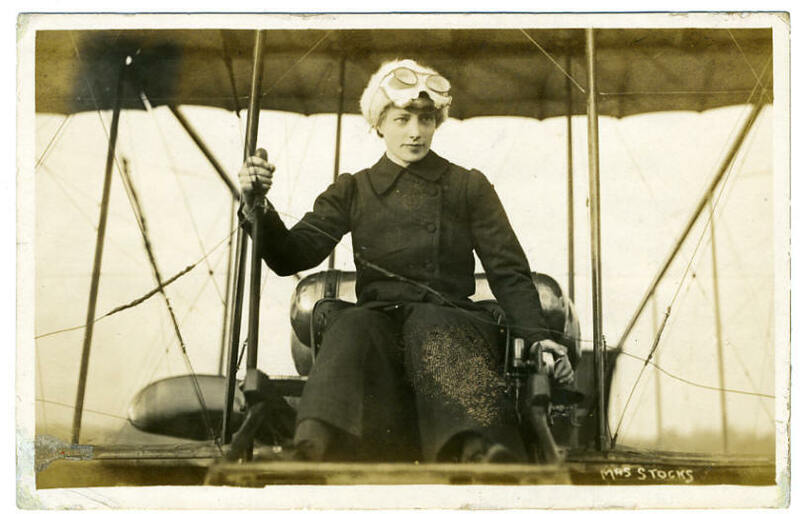 Ruth Law was a noted pioneer female aviator. She probably lived because her husband demanded, after an air show, that she give up this dangerous activity. But there were others. The early history of aviation is full of irony; Cal Rodgers flew his "Vin Fizz" across the U.S., crashing multiple times and still living to reach the Pacific. Yet one week later, he died in a rather insignificant flight in California. On and on...the story puts the pieces together. What a story. What a unique time in history. Postcards provide portholes into the past. Enjoy peering through these portholes. Enjoy the bravery that made today's flight possible. Note: The overwhelming majority (95%) of these cards are real photos. For example, The Chicago Air Meet in 1911 consists of printed views which are relatively more common than real photo images. Over nearly thirty years of collecting we only found a handful of real photos from this event.